In an exclusive chat with Delhi Post, English NRI Lord Bill Lall is vocal about his love for England, his journey and his new book. I t has been over 60 years that Dharambir Lall moved to England from India. His journey wasn’t easy back in 1958 when shops in the neighbourhood would have notices that read, ‘Rooms to let — Sorry, no coloureds, no Irish, no dogs’. Reckoned as Lord Bill Lall, the successful chartered accountant who is a millionaire, now holds the title of Lord of the Manor (Woodlands). He is also the first person from an ethnic background to be elected as the chair of Newham Chamber of Commerce, which offers local businesses the opportunity to network. The businessman-turned-author is soon coming out with his new book, ‘England, My Love’ which chronicles his journey in England and how the country has inspired him in many ways. 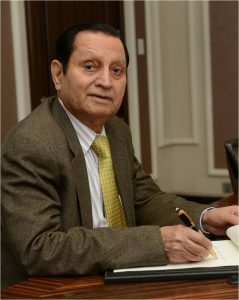 Lord Lall has authored two books till date which are titled ‘Rich Man Happy Man’ and ‘How to Grow Rich and Enjoy Life’. At the time of the release of his first book, he happened to come to India where the idea for the third book took shape. “My first book was published and launched in England. Soon thereafter, I decided to come to India after a gap of nearly 45 years because my elder brother was seriously ill and he passed away soon. So I took out time. Meanwhile, I met a few publishers in Delhi. I found my publisher to be very cooperative and amenable to my ideas. As a result of which you will see the layout of this third book is unusual. I wouldn’t have had that sort of freedom with a UK publisher,” he tells Delhi Post. Back in 2003, he was awarded an Honorary Doctorate of Business Administration by the University of East London, Freedom of the City of London in 2012, and the British Empire Medal in the Queen’s Birthday Honors list of 2014. “Setting clear goals and writing them down and visualising them regularly are my mantra for success. This is a message I conveyed strongly in my previous two books and also the message I gave to nearly 1,000 outgoing graduates at Barbican Centre in London, when I was awarded an Honorary Doctorate of Business Administration,” he says.